The wet clay shape will be nice and strong when demoulding, and when fired to cone 05 (1031C over 8hours), will have an enviable compatibility with available hobby glazes. Each Box contains 9.5 Litres of ready to use white casting slip. In a production environment we recommend wearing a EN149 Dust Mask FFP2 or FFP3. Further information can be found in the Health & Safety section of this website, refer to data sheets for TFF1505 white earthenware clay. 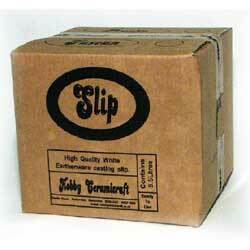 Slip is heavy, proceed to checkout to get a price to ship or call us for a quote. Best to collect or have sent on a pallet delivery. We do not send by parcel.